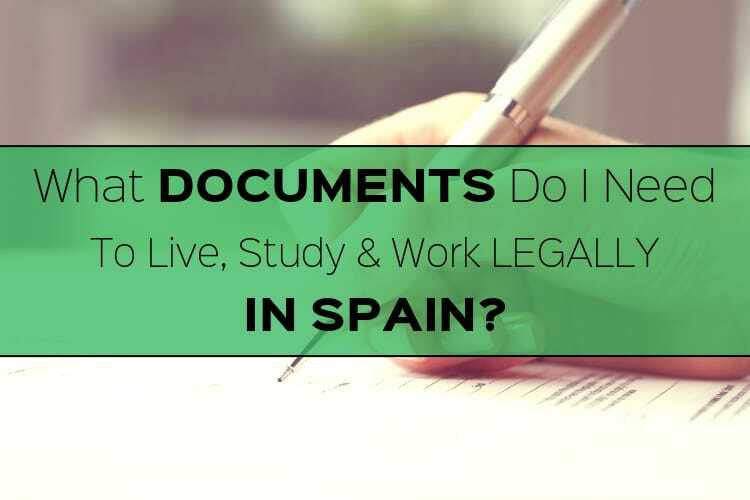 If you’re not from Spain, but are living or planning on moving here, then you will most likely need to have at least one of the following documents. 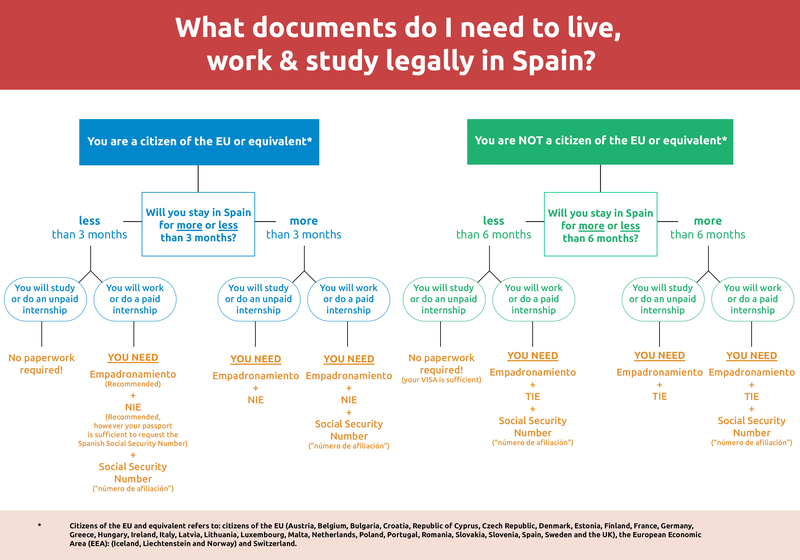 There are different documents required to live, study and work legally whilst in Spain. Here we will outline all you need to know about the NIE/TIE, Empadronamiento, and Social Security Number. To make it easier to understand, we will explain what each document consists of, and if it is necessary for you. Simply keep reading and follow the instructions! Empadronamiento: The Empadronamiento is an official document stating where you live. This will make you a citizen of the city in which you reside, and will be needed in many cases (especially if you are not a citizen of the EU or equivalent) to apply for any other paperwork like the TIE etc. NIE/TIE: The NIE (‘Número de Identidad de Extranjero’) is a number of identification assigned to any non-Spaniard who lives in Spain. It is necessary to carry out any procedures with administration services, to contract products and services, and ultimately to provide your identity number. EU citizens (or equivalent*) might need to apply for the NIE depending on the criteria in the graph outlined below (click on it)! The TIE (‘Tarjeta de Identidad de Extranjero’) is the identity card that all citizens of Non EU member countries (or equivalent*) have to apply for once they arrive in Spain. This identity card will contain a photo in addition to your NIE proving your identity and recognising you legally. So as a Non EU citizen you will need to apply for the TIE once in Spain, not the NIE! You really make it seem really easy together with your presentation but I find this topic to be actually something which I believe I might never understand. It seems too complex and very extensive for me. I am taking a look forward on your subsequent put up, I will try to get the cling of it! If you need any help with applying for Empadronamiento or Nie documents you can contact us any time!! I simply want to mention I’m very new to blogging and truly savored your blog site. Likely I’m going to bookmark your website . You absolutely have superb posts. Cheers for sharing your webpage. It´s very important to have some friend here in Spain. We can do easily all forms, specially if we come from European Union. The Empadronamiento is a document which you get on the same day of your appointment. They do everything with you right there and then hand you the paper :). If you move, you should apply for a new one under the new address and if you haven’t moved in 2 years you should renew the Empadronamiento :). Hello! I have a few questions. I’m not from the European Union, so what will happen if I apply than 30 days? Also, is it important in which immigration department I make an appointment or it can be any?? I’m assuming you’re talking about applying for the NIE? I can’t speak in absolutes, but it seems that as long as you at least have the appointment within or around the first 30 days you will be fine. You will need to make the appoint online, and they will provide you with a list of locations where you can have the appointment! To my knowledge you can apply for the social security anywhere! Your article is super helpful, i really appreciate your effort. I have two questions i hope can be answered. 1. I have my student visa and NIE, but i want to work part time as a model. Can my student NIE which is more than 6 month apply for a social security number and work legally? 2. For my empadronada, i don’t have the rental contract and even proof for monthly payment. Because i just found a place on idealista and the main host doesn’t live there. I pay cash to my roommate which he hand them to the casero, Can i still get empadronada? 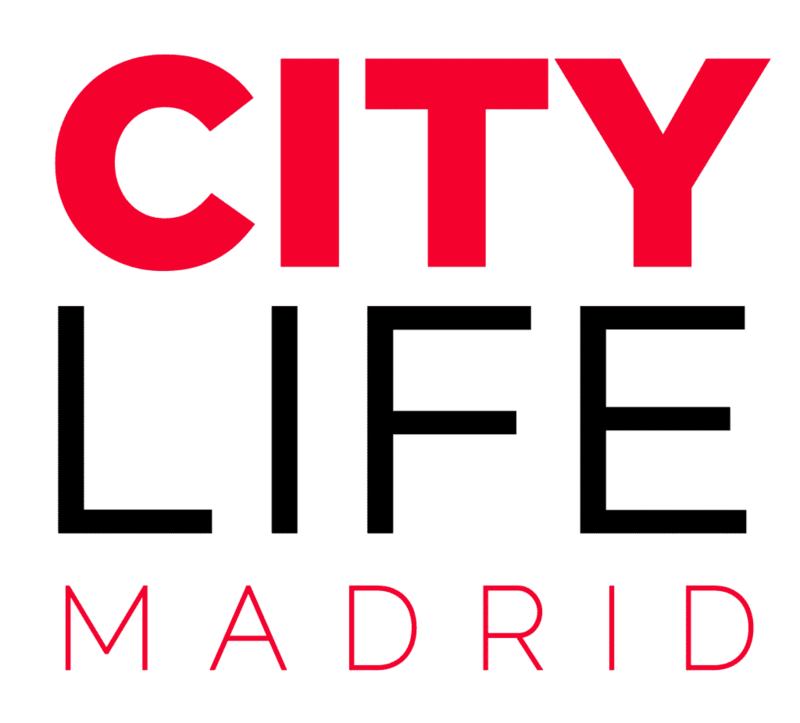 I have been in Madrid for the last 6 months and have just realized a massive mistake that I made. When I got to Madrid and saw in my passport that I had my NIE number, and thought that was all I needed. I didn’t actually go and convert it into the NIE card. My visa has now expired as of today, although I applied for an extension around 6 weeks ago. I have been accepted to continue my studies at my university here (same program. I am not changing) and they provided me all the documents that i’d require, but the biggest issue was that I didn’t convert my visa NIE number into an actual card. Am I going to need to return to my home country (Canada) in order to reapply?? This is super stressful.